Sea-level rise may be a big problem for saltmarsh birds, but so is predation, and birds sometimes find themselves caught between a rock and a hard place: They can place their nests lower in the vegetation to avoid predators, putting them at greater risk of flooding, or move them up to keep them dry but risk getting eaten. A new study from The Condor: Ornithological Applications finds that greater pressure from predators increases the risk of flooding for Seaside Sparrow nests—but the upside is that protecting them from predators could also mitigate the worst effects of climate change. The University of Georgia's Elizabeth Hunter (now at the University of Nevada-Reno) created a mathematical model to simulate Seaside Sparrow's nesting behavior and success rates, based on nesting data collected on the coast of Georgia. Her model shows that predation risk has had a much greater effect than flooding risk on nest survival rates. While flooding risk had essentially no effect on predation rates over this time period, predation risk did affect flooding rates—that is, because birds moved their nests down to avoid predators, they increased their risk of flooding. Under future sea level rise scenarios, flooding risk increases, but predation risk is still almost seven times as important for determining nest survival rates. "Nest predation rates are so high right now that even under extreme sea level rise conditions, more nests are likely to be eaten than flooded," says Hunter. 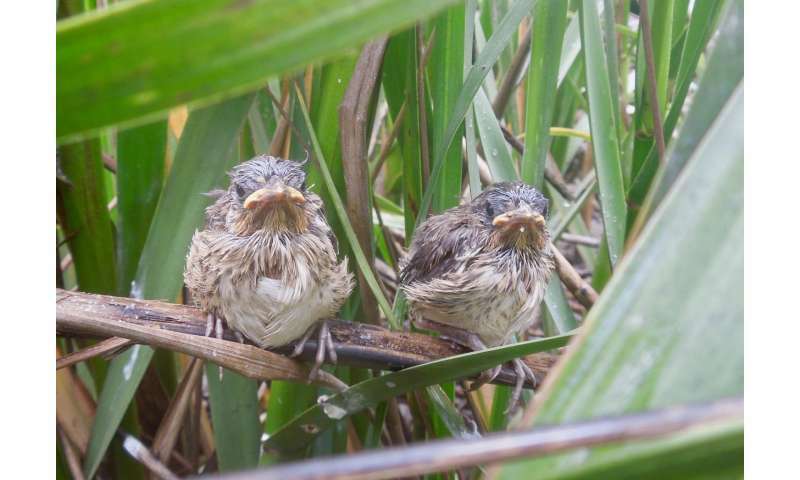 "However, predation and flooding threats act synergistically, meaning that any estimates of the negative effects of sea level rise on the nesting success of Seaside Sparrow or other species are likely underestimates if they do not also consider the negative effects of predation on flooding risk. The flip side of this is that management actions to reduce nest predation could also reduce the risk of nest failures from flooding." If measures such as fencing nest sites to exclude predators are taken, birds may place their nests higher in the salt-marsh vegetation, avoiding flooding from extreme high tides. "Elizabeth Hunter's research highlights both the risks that sea-level rise poses for coastal wildlife and the complexity of understanding those risks in light of other threats to their survival," according Chris Elphick of the University of Connecticut, an expert on tidal marsh birds who was not involved with the study. "The study nicely illustrates the importance of understanding the behavior of individual birds when trying to devise strategies to mitigate threats such as predation and tidal flooding. Regardless of the threat, it is increasingly clear that tidal marsh birds and their habitats are in trouble, and that we need to explore a range of potential solutions to find ways to help them persist in light of the many ways that humans are changing coastal habitats." What drives the evolution of bird nest structures?